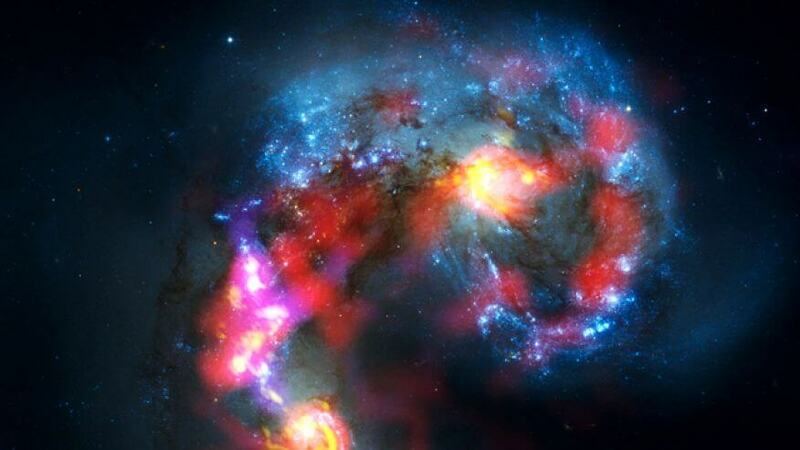 This composite shot of ancient star-formation in the Antennae galaxies is the first public image to be released from the Atacama Large Millimeter/submillimeter Array (Alma) — an enormous, international telescope being built in Chile. Alma is an array of giant radio telescopes, placed on the highest plateau in the Atacama desert, near Chile’s border with Bolivia. There are currently 20 telescope antennas on the plateau but by 2013 that total will reach 66. By hooking this many high-powered telescopes up to a supercomputer, moving the antennas across the desert to zoom in on galaxies, and observing light at millimetre and sub-millimetre wavelengths, Alma will be able to peer further into the cosmos than any telescope before it. Unlike most telescopes which have been trained on these interacting galaxies, Alma can unveil blossoming stars from deep within the core — inside the stellar factory that is usually hidden inside the dusty, gas-rich arms of these violently colliding spiral galaxies. ALMA radio telescope antennas on the Chajnator Plain at 16,500 feet, with the dormant volcano Licancabur in the background. The billion-dollar construction project will continues into 2013, as international partners Europe, North America, East Asia and the Republic of Chile keep building new telescope antennas to ratchet up Alma’s cosmic vision. In other telescopic news, the European Extremely Large Telescope (E-ELT) — which lives up to its name with a of 39.3-metre optical and infrared lens — has received a huge financial boost ahead of its construction commencement later this year. The Science Technology and Facilities Council (STFC) has confirmed plans to provide £3.5million in funding to develop the telescope’s key instruments.